Justin Benson & Aaron Moorhead are a filmmaking duo that have quietly made some of the best genre films the indie world has seen in recent memory. Their first film, Resolution, switched up the game when it came to stories about storytelling, and Spring, for all its interesting & intelligent monster movie elements, is a heartfelt and beautiful tale of love. Their latest, The Endless, goes back to a storytelling well the team dipped into with their first film, but it plays on such an elaborately greater level that it becomes a beast completely unto itself. The Endless is a horror/sci-fi film like nothing the cinematic world has seen thus far and only serves to prove Benson & Moorhead as some of the strongest voices in the world of indie cinema. 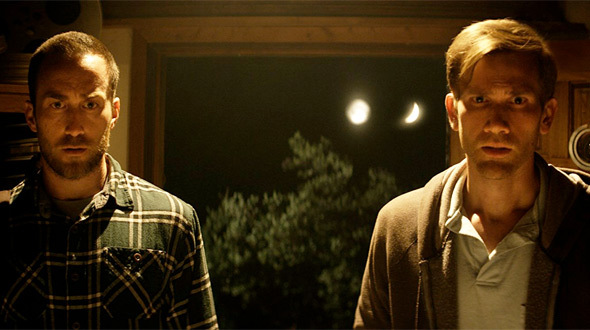 In the film, the two filmmakers play versions of themselves, Justin and Aaron, two brothers who ten years prior escaped from a cult located deep in the wilderness. Out of the blue, they receive a video package, a message from one of the cult members that convinces Aaron they need to return in an attempt at some sort of closure between the two groups. What the brothers find upon their return isn't what they were expecting. When they arrive, the cult takes them back in with open arms as if their departure from the group left no ill feelings in its wake. Justin is still a little apprehensive about the all-inclusive nature of the group, and the strange occurrences in the surrounding environment aren't helping matters. Aaron, on the other hand, is convinced the cult is the answer to the brothers' existential crisis that has been building since they first left. The mystery builds, the unanswered questions about the area and the group build with it, and Justin and Aaron must learn to depend on one another if they are to find a way to escape once again. It's a vague premise with which The Endless is working on, but that aspect only serves to hide the very deeply-hidden meaning about it all. Benson & Moorhead's films always work from a certain, abstract point of view that only reveals more layers and various pieces of an answer, not the answer itself. Cinematic artists like David Lynch and writers who dig deep into the questions of the universe like H.P. Lovecraft are clear inspirations for the works of Benson & Moorhead, but that never keeps the duo's films from working at the same level of enigmatic brilliance. There is such a clear understanding of mystery about their work. As with their previous works, the mystery at the heart of The Endless only aids in the strength of what the filmmaking duo is claiming about personal identity and human relationships. Storytelling has become the primary way human beings make sense of the universe surrounding us, and Benson & Moorhead keenly skirt around the answers to it all and still embrace the very nature of what it means to be human. They do this in the most personal of ways with The Endless. The reasoning behind the duo playing the two leads themselves builds on that personal essence in their latest film, and the two embody their respective parts with natural ability. Justin is the one who needs answers while Aaron is the more romantic of the two, able to blindly accept that the answers we seek from the universe aren't always the answers we want. The dynamic between the two is also a strong factor to the film, as well, and creates an organic bond that would potentially be absent should it be two other actors in the roles. The Endless has so many surprises in store for viewers, especially if the viewer is familiar with the films of Benson & Moorhead thus far, that it is rather difficult to go into more detail about how it all plays out. Nonetheless, the brilliance on display in their latest project cannot be missed or denied. The Endless is a fascinating and eye-opening look at human interaction and the way storytelling has consumed every aspect of the experience of our lives. Groundbreaking and mesmerizing, The Endless is the latest proof that the filmmaking team of Benson & Moorhead are ones to watch when it comes to cinema that makes you think.